US Chemical Storage’s drum storage buildings are designed to compliantly store 55-gallon drums. 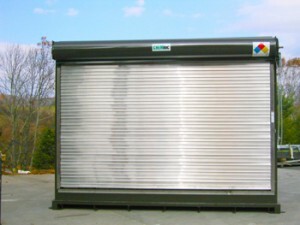 Our drum storage buildings are customizable to meet your specific requirements. All chemical drum storage buildings meet EPA, OSHA and NFPA regulations allowing you to gain full compliance. Drum storage buildings by US Chemical Storage meet EPA, OSHA and NFPA regulations. US Chemical Storage drum storage buildings are designed by professional engineers and experienced, certified welders. Hand-welded from heavy-gauge steel for maximum durability and strength for industrial use. Featured with our 15-year structural warranty, an EPA compliant secondary spill containment sump and a 2-part epoxy top coat to protect inventory from extreme weather conditions. Customize your drum storage building with a wide range of explosion-proof and non-explosion proof accessories to keep safe, secure and compliant. Our buildings are designed to store large volumes or small volumes of chemical drums compliantly. Contain your inventory 10 – 30 feet away from your facility with our 2-hour fire-rated construction or inside your facility with our 4-hour fire-rated construction. Given the ability to store drum storage buildings close or even inside your facility can increase your production operations and save you money by storing inventory on-hand. Our double-leaf door and roll-up door systems allow convenient forklift access for safe loading and unloading of your chemical drums. Manage internal climate control from temperatures ranging from -20°F to over 175°F and/or equip your drum storage building with a mechanical ventilation system for constant air flow to maintain a safe storage atmosphere for your chemical drums. Extremely strong hand-welded heavy-gauge steel construction. Explosion proof or non-explosion proof accessories. Seismic bolt-down plates and static grounding systems. FM or Warnock Hersey approved. Gravity air vents or forced ventilation available. Chemical and weather resistant epoxy top coat. Gain compliance with US Chemical Storage’s drum storage buildings to keep your personnel, investments and facilities safe.